ABC Entertainment President Channing Dungey said the comment "is abhorrent, repugnant and inconsistent with our values." Barr had apologized and deleted her Monday-night tweet, calling it a "bad joke," but the damage had already been done. The revival of the comedy was a surprise smash for ABC, owned by the Walt Disney Co., and was counted on to lead the network's fortunes next season. Its first new episode in March was seen by more than 25 million people, with delayed viewing counted in, numbers that are increasingly rare in network television. Dungey's statement canceling the show came after Wanda Sykes, consulting producer for "Roseanne," tweeted that she was leaving. Sara Gilbert, a co-star, also tweeted that the remark was abhorrent. 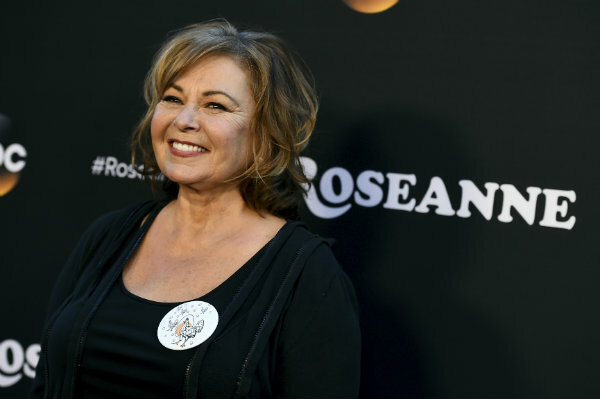 One of the few network shows about a working-class family, "Roseanne" attracted considerable attention upon its return when Barr's character supported President Donald Trump. That made the show popular with conservative viewers, and Trump himself suggested the character's backing had a lot to do with the show's success. The Jarrett comment was one of a series of political tweets made by Barr. She criticized Democratic financier George Soros and tweeted that Chelsea Clinton was "Chelsea Soros Clinton," implying she was married to a nephew of Soros. Clinton herself corrected Barr online, and Donald Trump Jr. retweeted two of Barr's statements about Soros, although not the remark about Jarrett. Jarrett, who is black, was brought up in response to Twitter commentary that raised her name in relation to an Obama conspiracy theory. Barr tweeted: "muslim brotherhood & planet of the apes had a baby=vj." She later tweeted an apology to Jarrett. "Forgive me," she wrote. "My joke was in bad taste." John Goodman is speculating that this fall's "Roseanne" spinoff will mean curtains for the matriarch played by Roseanne Barr.